The match between Portugal and Brazil yesterday night inspired me something. I see the “Four Colors Problem” there! And, YES. 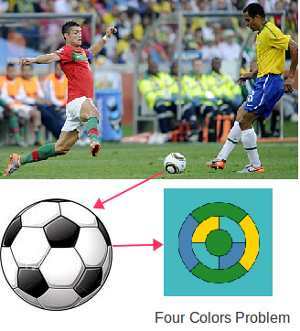 I heard Cristiano Ronaldo asked the people there why at most 4 colors are needed to color the subsurfaces of football such that any two neighboring subsurfaces are colored differently. “Why not more than 4 colors? What is the proof?”, Ronaldo asked the FIFA officer. A little history – Augustus De Morgan, a professor in University College, London first discussed (gossip?) the four colors problem with his friend Sir William Rowan Hamilton in 1852. Since then many proofs have been proposed but there isn’t any proof that explains the theorem beautifully (my believe). If you find this interesting, please help yourself at http://en.wikipedia.org/wiki/Four_color_theorem . By the way, the match between Portugal and Brazil yesterday is 0-0. That’s why he wanted to make the football colorful. seems like no one understand what are you trying to say wor.. 😛 i also dont understand.. Previous Previous post: What is Meeting?